FOREIGN PROPERTY BUYERS including Chinese | COMMUNITY ACTION ALLIANCE FOR NSW (CAAN): HOUSING INEQUALITY WITH AUSSIES LOCKED OUT! CHINESE AREAS GROUND ZERO IN PROPERTY CRASH: RYDE IN SYDNEY … hullo Harry! THE worst impacted areas of the bust in Sydney and Melbourne are those with high concentrations of illegal Chinese buyers due to China’s capital controls. In Sydney that is Ryde! As China slows, its capital account will close ever more to prevent a yuan collapse and the money will simply be stuck in China. TO save where we live from the Chinese and local developer Awfulizers, and restore housing affordability for First Home Buyers put the LNP last … check party preferences too! And number all the boxes! …The biggest fall in house prices are expected to remain in the Ryde area, in the city’s northwest, with a 15.8 per cent fall tipped for this year. As already noted, this report is garbage. But one thing it does illustrate to the knowing is that the worst impacted areas of the bust in Sydney and Melbourne are those with high concentrations of illegal Chinese buyers. In all likelihood the Chinese and ‘MILLIONS’ across Asia will look to migrate here once the price of property begins to rise again! View: Real estate agents, lawyers and accountants will be forced to report dirty money that is used to buy property if Labor wins the upcoming federal election. As real-estate agent Adam Wong works through Australia’s worst property downturn in decades, he’s also found himself at the mercy of China’s slowing economy. In Wong’s core market of Chatswood, a suburb north of Sydney’s harbor bridge where a third of residents claim Chinese ancestry, his sales have slumped by as much as half from their peak. 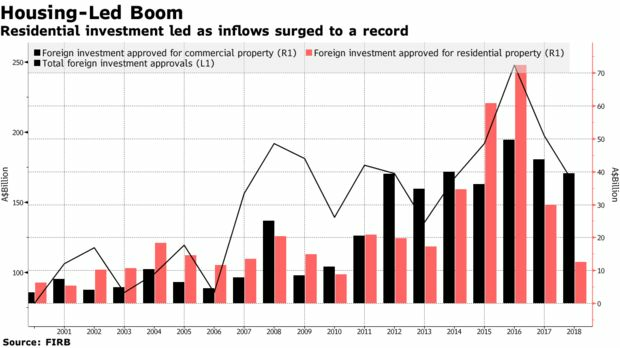 That’s reflected in recent government data showing China is no longer Australia’s biggest foreign investor amid a plunge in property purchases. Chinese appetite for apartments and harbor-side mansions helped drive an east-coast property boom that saw Sydney house prices soar 75 percent in the five years through mid-2017. The rally was also fueled by limited supply, rapid population growth and low interest rates. But since then, prices in Australia’s biggest city have dropped 13 percent. Chinese investment in Australia has surged since the turn of the century as buyers snapped up assets from mines to farms. In recent years, attention increasingly turned to real estate, driven by the appeal of Australia’s clean environment and a surge in Chinese students attending university there, encouraging parents to buy homes for their children. The Chinese didn’t just favor Australia. Investors embarked on a shopping spree that helped inflate asset prices around the world, snapping up everything from luxury condominiums in Canada to resorts in Hawaii and skyscrapers in London. Things got tougher for Chinese buyers when Beijing imposed capital controls to help stabilize its currency, limiting the amount companies and individuals could move abroad. Adding to this, Chinese authorities have been reining in a borrowing spree at home, allowing the economy to cool from the breakneck pace of the past in order to maintain financial stability. 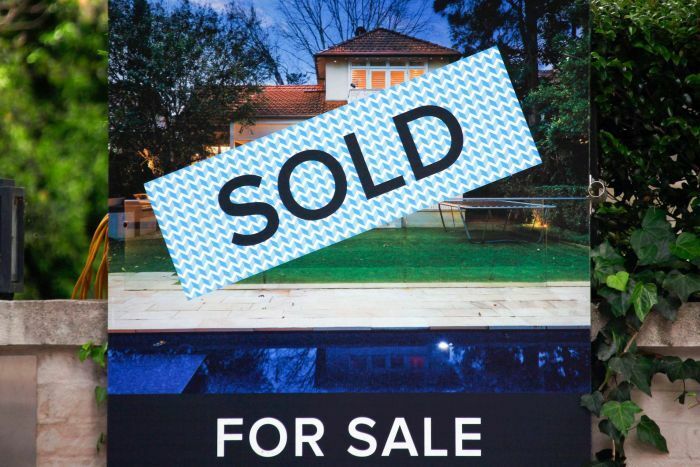 At the same time, Australian authorities — facing a political backlash over soaring house prices in Sydney and Melbourne — started tightening rules for foreign investors. Wong estimates the withdrawal of the Chinese probably accounts for about a quarter of the drop in Chatswood house prices. As to whether Australia still appeals to Chinese buyers, he reckons there’s nothing to fear there. ON what basis is it valid for foreign entities, foreign companies, foreigners to own Australian domestic housing? HOW can this be justified? HOW valid would it be for Australians to own a slice of their domestic real estate? WHAT is the agenda of the RE Sector? Is it that they are ignorant of PROXY Buying? Is it something they don’t know anything about? THIS is what the issue is about … the total number of Australian dwellings that are being bought by Foreigners … we are talking about the numbers! Foreign investor interest in Australia remains strong, the Foreign Investment Review Board (FIRB) chair David Irvine suggests. But the latest FIRB report revealed a strong shift with the United States stepping up its investment in the 2017-18 period accompanied by declining Chinese investment easing into second place. *CAAN: What has brought about the fall in Chinese interest in our Real Estate are the Chinese Government capital controls and as recently as early February 2019 gaol terms to deter the money coming out of China … and the mission China has taken on to covertly recover its Billions by employing former law enforcement officials as seen in the Four Corners Project Dragon! PROPERTY OBSERVER: The United Kingdom, Singapore, Canada, the Netherlands and France make up the top seven. The latest report on foreign investment showed the US recorded a $10 billion increase in approved investment to $36 billion in 2017-18, with significant increases in real estate and the*manufacturing, electricity and gas sectors. U.S. real estate investment is but a quarter of that of the Chinese! PROPERTY OBSERVER: China was the second largest source country with a $15 billion decrease in approved proposed investment to $23 billion. The reduction in approved Chinese investment was due to falls across all investment sectors but especially property. Chinese proposed investment peaked at $47.3 billion in 2015–16. 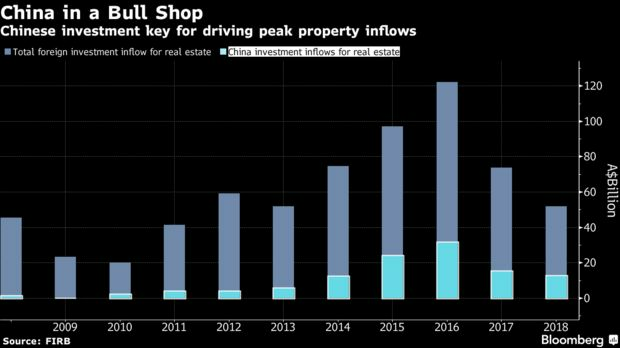 Chinese investment in real estate dropped to $12.7 billion in 2017-18 from $15.3 billion the year before, though still accounted for a quarter of foreign real estate investment. Victoria gets the greatest share of Chinese residential investment with 46% of all approvals, with NSW in a distant second with 23% followed by Queensland’s 17%. *The data doesn’t track people who don’t need to request approval, which means NSW might be actually getting more investment. CAAN: Obviously the “people who don’t need to request approval” are the onshore Proxy agents, Property Alliances, and Syndicates laundering the black money from China on behalf of their foreign clients in our real estate. International Organisations including Transparency International, Financial Action Task Force (FATF), the OECD have reported that Australia is awash with money laundering in its Real Estate! YET, as recently as October 2018 the Real Estate Sector was made EXEMPT from the Second Tranche of the Anti-Money Laundering Legislation by the Morrison Government! PROPERTY OBSERVER: But it seems Melbourne retains advantages over Sydney in terms of prices and taxes. Chinese buying is being impacted by several factors, local and international. 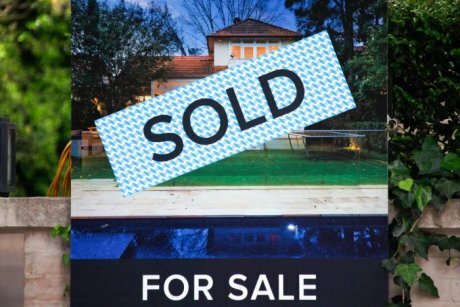 There’s been the unexpected cancelling of promised mortgage loans by Australian banks, plus the higher foreign stamp duty taxes, along with Chinese government capital controls making it more difficult to move money from China, suggests Carrie Law, the boss of the Chinese property portal Juwai. “We expect Chinese buying to be flat in 2019,” Law thinks. *I don’t think we ought regard the recent trend as permanent given tailwinds that will support Chinese buying including the still-strong Chinese wealth growth. *There is the desire to get a bargain while the market is soft. Plus, Law suggest there is a lack of investment opportunities in China, along with a possible shift in investment from the U.S. to Australia due to any emerging trade war. 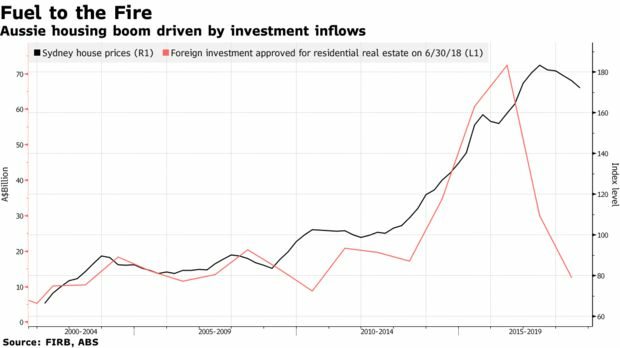 *Additionally the yuan’s weakness is not holding back investment in property as there is an advantage in currency rates in favour of Australia compared to other major countries. The Chinese also lack appealing alternative investments at home. CAAN: Would not these factors indicate an IMPERATIVE NEED for the FIRB to stop the sell off of Australian domestic housing? Due to these factors a Whole Cohort of Australians remain locked out of the Housing Market! PROPERTY OBSERVER: *Interestingly, the Federal Government’s crackdown on residential properties held by foreigners in breach of the foreign investment rules uncovered just 131 now-sold illegally held properties in 2017-2018. CAAN: It would appear the pathetic total of 131 properties found to be illegally held by foreigners is due to almost 5,000 ATO Officers having been made redundant. Therefore how effective can a Federal Government/ATO “crackdown” be? The real numbers of foreign-owned dwellings particularly from China are concealed by the onshore PROXY buying. PROPERTY OBSERVER: *No nationalities were advised in the figure which was up slightly from the 96 ordered forced sales in 2016-17. There were other breaches that did not see any forced divestment. More than half the breaches identified were residential property in Victoria, while 20% related to property in New South Wales after the Australian Taxation Office (ATO) completed around 1,400 residential real estate investigations during the year. ATO data matching analysis is increasingly important in compliance investigations. Data matching made up 63% of the 1,700 cases investigated in 2017–18. Although information received from the community is a source of intelligence, only a small proportion actually involved a breach of the Act. **The report noted that in most cases the owners of the properties reported by community members were found to be Australian citizens or permanent residents. That suggests we might a little too quick to judge our new neighbours. CAAN: Question why were the Nationalities concealed? Obviously “in most cases the owners of the properties … were found to be Australian citizens or permanent residents” because the onshore Proxy, family, friends, Syndicates, and Property Alliances have been set up to launder money in our Real Estate. And through various Visas following buying property tourists, students, investors, family, etc can gain a “Permanent Resident” Visa. It would appear it has all been set up! This has evolved over decades … dating back to the late 1990s of the Howard Government … to entice the Chinese Middle Class to invest in our Real Estate to gain “Flexible Citizenship” .. The Chinese Communist Party (CCP), is the founding and ruling political party of the People’s Republic of China. The Communist Party is the sole governing party with 8 other subordinated parties co-existing making up the United Front! ALAN KOHLER: FIRB approvals for foreigners to buy Australian housing fell 58% in the 2018 Financial Year to $13 Billion. Less than 20% of the total approvals, and the lowest levels since 2010. Now it’s happening because of higher government taxes on foreigners plus greater scrutiny of them, and local banks are not very interested in lending to foreigners any more. This has continued despite FATF, Transparency International, OECD and others have warned that Australian Real Estate has been awash with Black Money! ALAN KOHLER: And as we saw on Four Corners last night in Project Dragon, they are having more trouble getting their own money out – especially from China. Now foreign buyers were a big part of the reason house prices went up so much. So their departure helps explain the falls, of course, also there are more than 200,000 apartments currently being built; many of them sold off the plan to the vanishing foreign buyers … so developers would be now getting very nervous! IS this a case of greed has got the better of you? That the business model based on ever increasing house prices might actually be akin to a ponzie scheme? IS it the case they don’t want to talk the truth, they want the gravy train to continue so the incessant chatter about adjusting to new market conditions, casting our marketing further afield, offer more to foreign buyers’ are signs things are not so good out there in home land? IS it this lot who are hell-bent on ensuring high-rise developments happen; reshaping our urban environment because simply put there’s money to be made for all these hangers-on? .have a minimal regulatory environment especially for the Building Industry in standards, compliance and certification? .rezoning available beyond the reach of local councils and communities? FINALLY, is it this lot along with their mates that turned shelter into a commodity, that housing is no longer about people or communities? IS it about wellbeing, and families, or as they see it only about returns for investors? Real estate advertising portal Domain has taken a savage $178 million haircut to its value thanks to a crumbling housing market and the evaporation of properties listed for sale. In its first-half results announcement, Domain said lower-than-expected listings in the Sydney and Melbourne markets required a re-assessment of carrying value in company. The write-down comes a little over a year since Domain’s ASX listing in the wake of its separation from the old Fairfax media group, which is still its majority shareholder in its new form as a merged company with Nine Entertainment. The big hit to goodwill saw Domain’s first-half result tumble to a $156.4 million loss, down from a $3.3 million loss in the previous corresponding period. It is the second significant write-down the company has been forced to take in its short life, following a $30 million blow in August last year on costs associated with rebranding. The underlying first-half result — stripping out one-off items, such as the goodwill write-down — was a $21.1 million profit, down 14 per cent on last year. Sales revenues were effectively flat — up just 0.3 per cent — to $184 million for the half. The loss of goodwill is treated as a non-cash item and does not affect banking covenants, the company said. Domain has endured a rough start to life on its own, putting up its shingle on the ASX in the midst of the most savage decline in the Australian property market in at least a decade. It also lost its initial chief executive, the high-profile former Fairfax journalist Anthony Catalano, in contentious circumstances just two months after listing. Tanking house prices and thin new listings have seen its share price tumble 30 per cent from its opening day close of $3.69 a share. Current Domain chief executive Jason Pellegrino said it was a “solid performance” in the context of the current property market. “We are confident in Domain’s long-term growth prospects and have a strategy in place place to build on our solid foundation, scale and capability as we enter our next growth phase,” Mr Pellegrino said in a statement to the ASX. The company slashed its interim dividend from 4 cents a share last year to 2 cents. However, the market was expecting worse and bid Domain’s share price up 22 per cent to $2.56 in early afternoon trade (at 2:00pm AEDT). 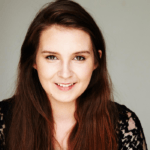 It appears this article is full of contradictions! One minute Mr Ng says there is no-one bailing out, and at the end he is saying there is no interest … ??? Probably because they are set up to pay another way? A Melbourne-based developer has offered its Chinese buyers an option to pay for the purchase of townhouses in China, as developers get more creative in their sales tactics amid a slow market. Faced with slow sales after the launch of the small three-townhouse project at Glengarry Avenue in Burwood, the private developer tapped its lead agent Kollins Property Investment to send the private offer to clients listed on their database. “Client can pay in renminbi in China,” the email said. Buyers would pay the developer, which has an office and account in China, without having to transfer money to Australia. Developers have started to think outside the square on how to market their products as the market continues its downturn, Kollins’ Kelvin Ng said. Tactics include rebates, utility packages, and car or furniture giveaways which entice buyers without an effective “price reduction”. “I don’t think they are desperate. They are just being more creative in trying to move their stock,” Mr Ng said. Mr Ng said since sending the email in late January there had been no interest from buyers. As Kollins was only facilitating the sale, it couldn’t elaborate on how the transaction would be carried out, but it is likely that a contract would be drawn up by local lawyers. The developer also offered a generous commission of 6 per cent to agents who sell the three and four-bedroom townhouses set on lots of 150 to 300 square metres. Prices for the homes start at $1.2 million. Mr Ng said that, aside from new gimmicks, many developers were also looking to put up their unsold units as short term or “Airbnb” rentals to staunch a temporary cashflow bleed, and selling them later when the market picks up. AMP Capital has announced that a planned redevelopment of the Macquarie Centre will continue to have an Olympic-sized rink. City of Ryde mayor Jerome Laxale called the decision “a great development” and thanked the tens of thousands of people who joined the campaign. “Our job now is to ensure that the Olympic-sized rink is retained in stage one of the redevelopment,” he said. “It shows how much our community values open space,” he said. “Although it’s an ice rink, people use this site as they would usually use a park. HOWEVER, many are still concerned the site has a 37-storey zoning! WHAT will happen to the ice-rink, the business, the jobs, and this very important community asset over a lengthy period if a 37-storey development were to go ahead? The people have won the battle for the Macquarie Ice Rink in Sydney’s north-western suburbs. After a community outcry that included petitions signed by more than 60,000 protesters, AMP Capital has announced that a planned redevelopment of the Macquarie Centre will continue to have an Olympic-sized rink. An artist’s impression of the proposed redevelopment of the Macquarie Centre that would have forced the closure of the iconic ice rink. The managing director of AMP Capital Shopping Centres, Mark Kirkland, said the company had listened to the community’s feedback. “Their outpouring of support shows us they are passionate about retaining an Olympic-sized facility,” he said. Ahead of a planned major upgrade to the shopping centre, AMP Capital had told owner Frank Gregg that the ice rink’s lease would finish on January 31 next year. The protests included a Change.org petition and dismay from Olympic gold medallist Steven Bradbury, who said it was “sad to see how many sports spaces have been gobbled up due to the ridiculous demand for real estate across Australia”. Other elite skaters described the planned closure as “devastating” and an “absolute disaster”. AMP Capital asked the City of Ryde council last month to put its development application on hold for further consultation over the ice rink’s future. Dr Gregg was delighted by AMP’s decision. While having a recreational rink in the redevelopment was a possibility, Dr Gregg said an Olympic-sized facility was essential for the skaters and ice hockey teams who use the rink. Future Olympic gold medallist Steven Bradbury won the 1991 Relaying World Championships at Macquarie Ice Rink when he was just 17. Cr Laxale described the community response as extraordinary. But Cr Laxale said many people were still concerned the site had a 37-storey zoning. “That’s still an issue,” he said. The member for Ryde and NSW Finance Minister Victor Dominello called the decision “great news for the community and a victory for people power” after robust discussions with AMP Capital. “The ice rink is a vital community asset and today’s decision will ensure it is protected and preserved for current and future generations,” he said. CHINESE BUYERS LOOKING TO ‘GRAB A BARGAIN’ IN 2019 … AND WHY THE LNP MUST GO! A MUST READ! Absorb and share this important information with Everyone! WHAT if the LNP were to change the policies that allegedly block foreign investment and break the dam wall? -ask the ALP what they will do about this! HOW likely is it that the Chinese use the Australian Banking & Finance Sector? -the yuan currently sits six per cent higher against the Australian dollar than it did at the same time last year. –it sits low against the US dollar; combined with the budding trade war in the US, makes Australia an easy choice for investment. 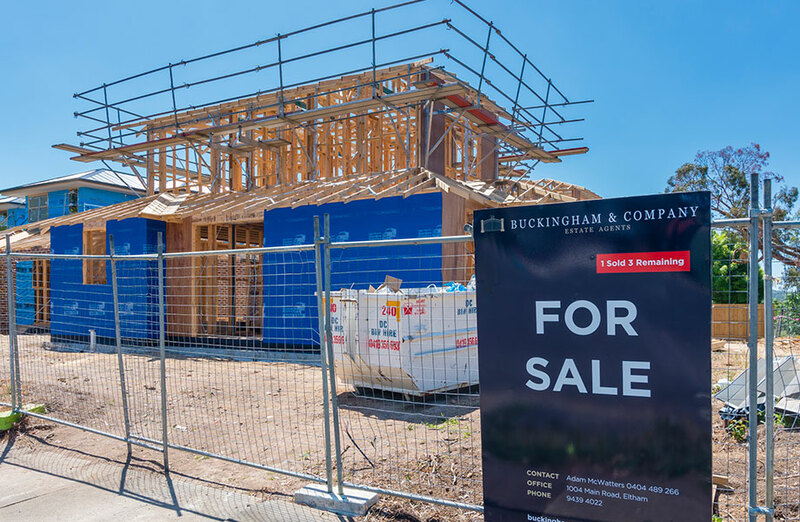 Juwai.com has released the Australia 2019 Outlook for Chinese Residential Real Estate Buying, which shows that 2019 will continue the strong outlook for Chinese investment as buyers are attracted by dropping prices in key markets. According to the report, Chinese buyers will be bolstered by strong Chinese wealth growth and the desire to get a bargain while the market is soft. A lack of investment opportunities both in China and in other regions such as the US due to the trade war are also motives behind further activity in Australia. “Unlike Australians, Chinese lack appealing alternative investments at home. Bank deposits earn unnaturally low rates of return, Chinese stock exchanges are still immature and were the world’s worst performing in 2018, Chinese real estate is tightly regulated to make investing difficult, and peer-to-peer lending and private equity funds have collapsed due to fraud, poor management and government crackdowns,” said Juwai.com CEO and Director Carrie Law. There are, however, a few barriers in the way of Chinese acquisition of Australian property. These barriers mean the rates are far lower than the current demand, according to the report. *2015 and 2016 were boom years for investment, but that dwindled across 2017 and 2018. The numbers in 2019 are expected to stay the same unless Australia sees change in any of the policies which block foreign investment. “Our metaphor is aquatic. The huge reservoir of Chinese demand is like water held back by a dam. That dam consists of capital controls, onerous Australian foreign buyer taxes and the difficulties obtaining financing in Australia,” said Ms Law. “In 2018, Chinese residential buying inquiries were down 20 per cent compared to 2017. But the news wasn’t all bad. In the fourth quarter, Chinese buyers made 58.1 per cent more enquiries on Australian property than in the same period in 2017,” according to Ms Law. May was the lowest month for enquiries, with October seeing the peak. These levels are expected to continue in 2019 due to the restrictions mentioned before, but we’ll still see Chinese buyers representing the highest percentage of foreign investment at 22 per cent. The report shows that Chinese buyers spent approximately three to eight per cent more on foreign property in 2018 compared to 2017 levels, which sat at US$129.3 billion. The most popular Australian cities for Chinese investment in 2018 were Melbourne, Sydney, Brisbane, Adelaide and Canberra. Regionally, the most popular locations were the Gold Coast, Newcastle, the Sunshine Coast, Cairns, Wollongong and Geelong. “Victoria will continue to receive the greatest share of Chinese residential investment — both by offshore and local Chinese buyers. The state, according to Foreign Investment Review Board data, receives about $4 of foreign real estate investment for every $3 that go to New South Wales and for every $2 that go to Queensland,” said Ms Law. There is no chance Sydney will be knocked off the second place position in 2019, says Ms Law. With its iconic landmarks and popularity as an ‘iconic city’, Chinese buyers will still want a piece of the action. The interest in Brisbane is driven by families with children who are studying in the city. More than 33,000 mainland and Hong Kong students were studying in Queensland in 2018, a significant increase from 21,000 in 2015. Chinese buyers interested in this area are hoping to make a profit on student accommodation and purchase property which can then be rented out. “This year, in all four cities, we expect Chinese buyers to continue to focus their demand on new apartments and house and land packages. Outer suburbs where new estates are going up are stealing buyers away from more traditional inner-city locations. Where developers or third parties can provide financing, demand is likely to follow,” said Ms Law. Chinese buyers are getting richer, and the yuan is currently sitting very favourably against the Australian dollar, which makes Australian property a tempting investment opportunity. “China will probably pass the USA in GDP size this decade to become the world’s largest economy. It is already the world’s largest manufacturer and biggest exporter. There are now 3.5 million US dollar millionaires in mainland China, and wealth per adult has more than quadrupled over the past six years,” said Ms Law. The yuan currently sits six per cent higher against the Australian dollar than it did at the same time last year. Despite this, it sits low against the US dollar and other major currencies. This, combined with the budding trade war in the US, makes Australia an easy choice for investment. “Australia has always competed to some degree with the US for Chinese students, tourists and property investment,” said Ms Law. “With the trade war making some Chinese investors increasingly nervous about making new acquisitions of US real estate, some of those investors may turn to Australia as a natural alternative. Chinese students who turn away from US schools and universities may also choose Australia instead, which would also have spill-over effects on local real estate investment. 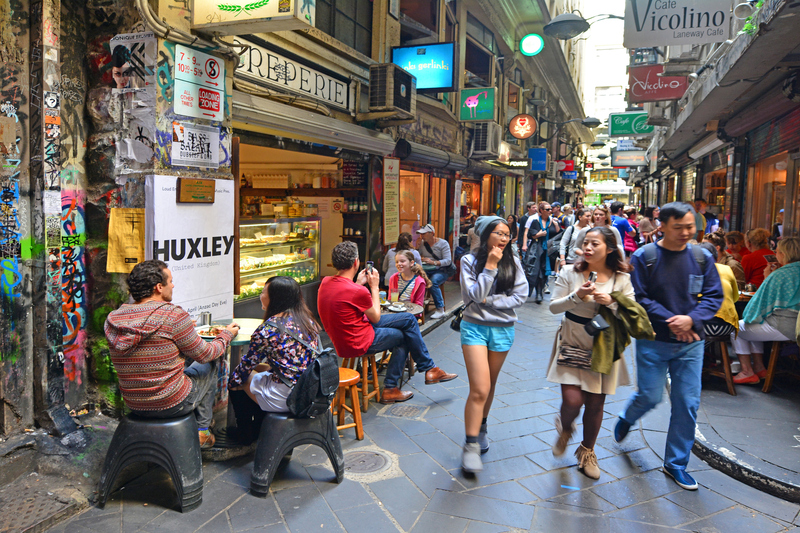 Photo: The Urban Developer: Chinese buyers chose to purchase Melbourne property ahead of Sydney in 2018, with Melbourne expected to retain the top spot this year too. Is the Chinese love affair with Australian real estate over? Chinese buyers spent less in 2018 than previously. What about 2019? Chinese buyers helped drive the property boom in Sydney and Melbourne property that lasted about five years and fizzled out in late 2018. But with tighter lending rules and global factors affecting foreign demand in Australian property, how will the market be impacted? New data from Chinese property portal Juwai.com shows interest from buyers dropped 20 per cent last year. But the final three months of 2018 saw inquiries surge almost 60 per cent. Juwai spokesperson Dave Platter joined Your Money Live to explain what’s going on with foreign buyers. “This is a year on year quarter spike. It could just be a quarterly variation, a low quarter the year before and a high quarter that year,” Platter said, explaining the sudden surge of inquiries in late 2018. Chinese buyers living in Australia are given more flexibility and can buy any property they want. The rules are more stringent for offshore buyers. The Foreign Investment Review Board requires foreign buyers only to buy new developments. “That’s why you see a lot of Chinese buying new apartments, new townhouses, new houses and land packages. Chinese buyers are very interested in new property as a rule, and then these rules just push them further in that direction,” Platter said. Despite the rules, Chinese spent US$180 billion on global real estate in 2018. Australia is still very much on the map for Chinese buyers. In 2018, Chinese buyers spent $32 billion on Australian real estate. Why is Australia such an attractive place for Chinese property buyers? Platter says Chinese people have a reputation for saving and generally save 50 per cent of their income on a national average, but have limited options for investment. “In the banks, you get a very low interest rate because they are kept artificially low by the government. “If you put it in stocks you get a very bad return because it was the worst performing stock market in 2018 in China. “And if you put it in equity or some alternate investment, you get into trouble because the government is investigating these funds. “Australian real estate looks like the best investment in comparison,” Platter said. What does this mean for the Australian property market? 2019 will likely see the same amount of buyers and money flowing in as last year, Platter said. Juwai.com predicts Melbourne to continue to be the top destination for Chinese property buyers. “Melbourne gets about $4 [for] every $3 that Sydney gets of Chinese investment. “A developer I was speaking with today in Melbourne is building townhouses 25 minutes from CBD. The US-China trade war is “scaring some investors” and could drive more Chinese buyers on our shores. Students, workers and entrepreneurs who are finding it difficult to gain entry into the US because of President Trump’s visa policies could shift to Australian universities and jobs, Platter says, which would drive up demand. “More Chinese buyers could mean higher prices in certain segments, fewer could mean lower prices in certain segments,” Platter said. ARE FOREIGN BUYERS FLEEING AUSTRALIAN HOUSING? … HOW WOULD THE BANKS KNOW? HOW would the NAB know … it’s a Bank … what about the Money Laundering, the Black Money awash in Australian Real Estate … ? WHAT of the PROXY … the onshore Buyers Agent, the relative, the friend able to launder the black money on behalf of the foreign buyer? IF this wasn’t happening why did the Scomo Government as recently as October 2018 EXEMPT the Real Estate Sector – RE Agents, Lawyers and Accountants from the Anti-Money Laundering Legislation, the second tranche for the Real Estate Sector? CURRENTLY RE Agents are cancelling or delaying Auctions, and leaving sandwich board signs in the street inviting home seekers to find the Agent inside! WHY is NSW INC forging ahead with the high-rise Precincts of Waterloo, Rhodes, Telopea, Macquarie Park, Parramatta, ever more house and land packages in Sydney’s NorthWest and SouthWest if it were not for the foreign buyer market? CAAN Photo: Chinese developer JQZ at Waterloo Road, Macquarie Park, promoted as a Precinct in itself! p.s. it has grown lots since this photo was taken! 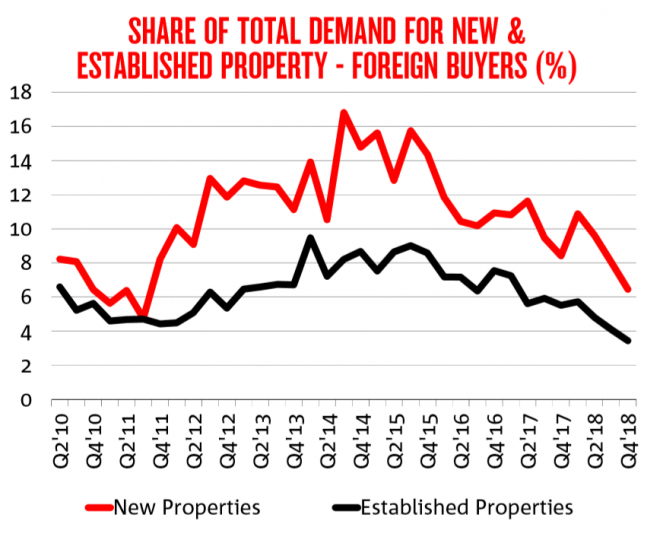 The boom in Australian real estate sales to foreign investors has clearly run its course, with NAB’s latest survey results highlighting a trend decline in foreign buying activity over the course of 2018. In Q4, the market share of foreign buyers in Australian housing markets fell to just 6.5% in new housing markets (their lowest share since Q3 2011 and down from a high of 16.8% in late-2014) and a survey low 3.4% in established markets. In established markets, the share of sales to foreign buyers also fell to a survey low 3.4% in Q4 2018. Property professionals in VIC and QLD reported the highest share of buyers in established housing markets – both at 4.4%, followed by NSW (3.0%) and WA (2.5%). 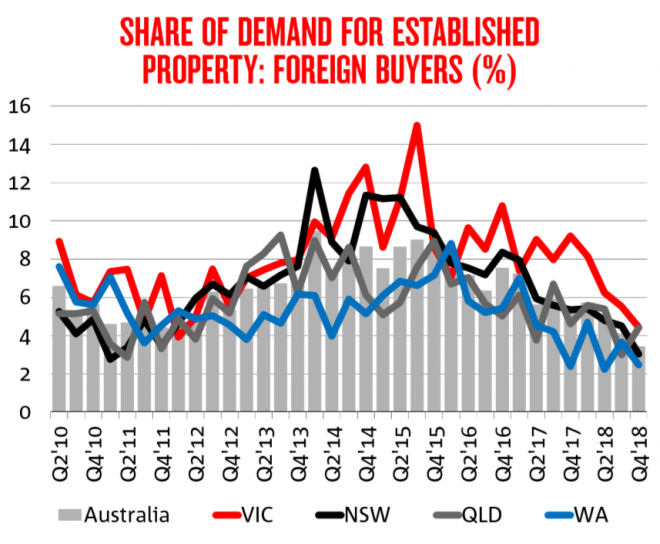 The share of foreign buyers in established property markets has fallen below survey average levels in all states and currently stands at a near 7 year low level in VIC and a near 8-year low in NSW. In new housing markets, the share of sales to foreign buyers fell in all states except QLD where their share rose to 7.9% (6.2% in Q3). 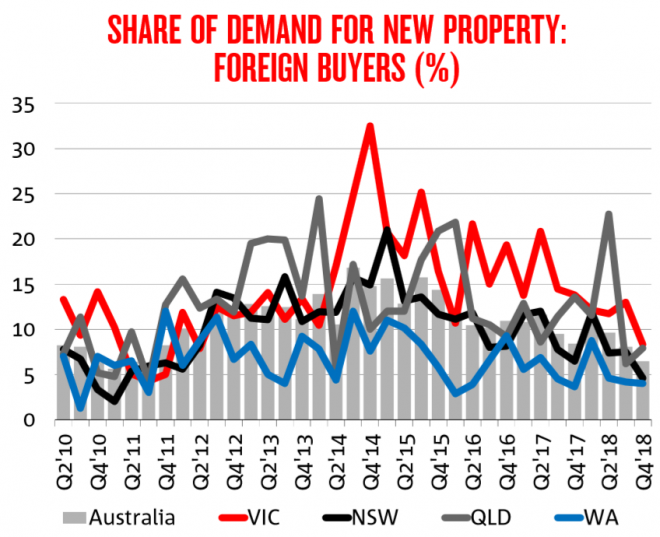 VIC continues to lead the way for foreign buyers, but their market share has now fallen to just 8.3% down from 13.0% in Q3 and well below survey high levels of almost 33% in late 2014. In NSW, the share of foreign buyers fell to 4.6%, down from 7.5% in Q3 and their lowest level since Q1 2011. This data directly contradicts Juwai’s claim that Chinese buyers are returning. It was neither a good time nor a long-time!